At Crunch Analytics, we have been developing numerous data-driven solutions in a variety of industries and what we found is that these are all delivered in the same way. Namely, by following each step in what we call "the Data Chain". The Data Chain offers a great and simple representation of how a typical data-driven project is delivered, from start to end, from business need to business value. Of course, we could use a lot of technical terms to explain how it works such as data lake, ETL jobs, reinforcement learning or data mining. Instead, we'll approach the problem like many companies approach their operations, from a supply chain point-of-view. And as we are a true Belgian company, we'll use a supply chain that reflects our heritage: the one that produces high-quality beer. Based on these categories, you can now identify specific projects at your company which help you reach your business objectives much sooner. These projects are the end goal of your value chain and provide you with massive business value. The complete chain is visualized in the image below and a detailed description of the different steps is provided in the remainder of this article. Brewing beer requires four key ingredients: water, barley, hops and yeast. In order to brew the best beer, you do not only require every single ingredient, but they also need to be of the best quality. Because without water, no beer and with bad water, bad beer. The same thinking applies to data and analytics in general. You need to have all the required data in order to draw out maximum value in the end. Next to that, the data should also be stored properly and should be preprocessed if needed, this to ensure that you can easily grab and process it without any massive transformations needed. If you ever heard about Big Data, this is the area it has most impact on, referring to the exponential growth in the volume and velocity of data we are currently experiencing. But that does not mean anything unless you process all that data in the following step. This is where the fuzz is all about, you can have the best ingredients, but without mastering the brewing process, not a single bottle of great beer will be produced. This is why it takes homebrewers years and years of practice and trial & error to become masters. But once they know the specifics of the process, they magically transform four simple ingredients in a great refreshing beer. So how does this relate to your data? Well, even if you have all your data, you will need algorithms to transform it in untapped value and insights. The fact is that this area, referred to as Data Science, is the most interesting but also the hardest to grasp. Terms like Artificial Intelligence (AI), Machine Learning, Deep Learning and many more make it difficult to express your needs. At Crunch Analytics, our in-house data science team masters the skill to look beyond terminology and apply the correct technology at a given step. So if your company is highly Excel-driven at the moment, then understand that you do not have the best brewing process yet, and there is a lot of money left on the table. Even if you were able to brew a word class beer, storing it in a contaminated bottle or pouring it in a silly glass, will never bring its full value. It requires many steps, both marketing- and product-related efforts, to create a high quality image and experience of your beer, in order to provide the customer with a high-quality beer which he will really enjoy. So even with world-class insights drawn from your data, it does not bring you any value unless you hand those insights in a perfect format to a person who can and does put them to action. This also applies to managing AI-driven algorithms which automatically run, manipulate and optimize your processes. It is key to provide users with an easy way to tailor these algorithms to changing market conditions, to understand what actions they are taking and what output these actions generate. This is the ultimate goal as well as the start and end of the complete process, with continuous feedback to all the other steps in the chain. In the end, a great beer is only a great beer when people really like it and buy it. That is where the power of a market research study comes in, it helps to identify which beer your customers really want the most. Because only that specific beer will generate the most business value, much more than simply pushing one into the market. 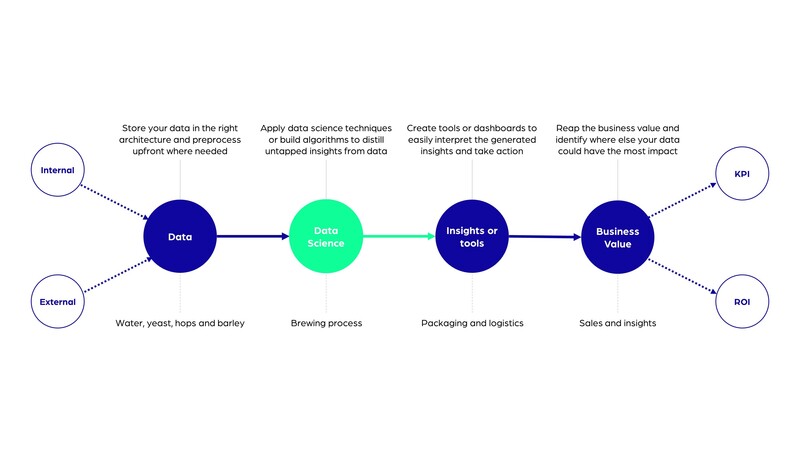 In the same way you would conduct an extensive market study to find the next successful beer, take the same approach to data science projects. Put a lot of time in understanding the technology and how it could provide you, in your specific situation, the most value. Set up a data strategy which starts from your business objectives and not from the technology itself. The same thinking applies to the internet, it is not the technology which brought the most value, it is the fact that it enabled video streaming, web shopping, easy communication and multiple other services that everybody wants. Companies are often looking at each step independently and lack experience or expertise in at least one of the other steps. Instead, they should identify the way to connect all the steps, identify their bottleneck and fix it. Because if you lack expertise in at least one step, it will hold you back to generate the full the potential data can create in your company. Everyone can brew beer at home, but unless you already obtained extensive experience, it will cost years of trial and error to eventually master the craft. So unless you already have the right people on board, you developed and implemented some initial cases and your data strategy is defined to grab all the value, start small with some simple cases and build your skills. If not, unorganized and big initial efforts will lead to failed projects and make you halt any future investments, which will lead you to miss out on the real opportunity. It is hard to keep the process, to create impact through data running, smoothly but a simple overview like this should greatly assist in keeping the bigger picture clear. So go out and identify the greatest beers you want to brew, make sure you have all the ingredients, get the skills to brew intelligence out of it, package it correctly in tools and dashboards and you will see business value quick. Interested to discuss the situation and possibilities at your company? Always happy to talk over a great, fresh beer. The Data Chain offers a great and simple representation of how a typical data-driven project is delivered, from start to end, from business need to business value.